Prime Minister Sheikh Hasina urged all on Wednesday to remain alert so that militant acts cannot be carried out in the name of Islam as it promotes peace and rights of people, reports UNB. "We've to take steps so that Islam always remains on top," she said. She was inaugurating the Hajj programme-2018 at Hajj Camp in the city's Ashkona area. 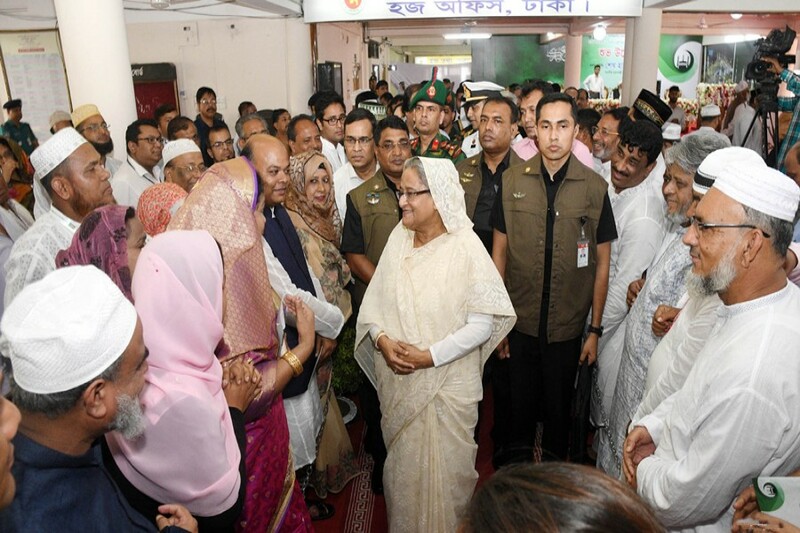 Sheikh Hasina said Islam believes in peace as it repeatedly says about the rights of human beings and welfare of people. "But often we see some people in the name of this religion engaged in terrorist acts and creates militancy and this puts our religion into question before the whole world," she said. She mentioned that some people created anarchy and problems just to undermine "our religion". "Nobody has the right to malign our religion." "We've taken a project to construct 560 mosques in different areas of the country under the supervision of the Islamic Foundation," she said. Hasina mentioned that 80 per cent places for those mosques were selected, the project involving Tk 8.0 billion got the government's nod. "Apart from being used for prayers, these mosques will spread the real meaning of Islam so that no one can confuse people," she said. Chaired by Religious Affairs Minister Principal Matior Rahman, the programme was addressed, among others, by Civil Aviation and Tourism Minister AKM Shahjahan Kamal, Chairman of the Parliamentary Standing Committee on Religious Affairs Ministry Bazlul Huq Haroon, Advocate Sahara Khatun, MP, Saudi Charge d'Affaires Amir Bin Omar Bin Salem and Secretary Md Anisur Rahman.